I recently watched a documentary called The True Cost (available on Netflix) about the social and environmental costs of the fast fashion industry. The basic gist is that our North American/Western consumption habits are ruining the world. This is probably not news but when you see the piles, correction, the MOUNTAINS of clothes that take up Bangladeshi landfills because of our desire for $5 t-shirts, the Rana Plaza type disasters that have become far too common, and hear about the hundreds of thousands of farmers in the Punjab who commit suicide when Monsanto claims ownership over their cotton farms, it should seriously make us re-consider our purchasing habits. That’s great Courtney, but what does fast-fashion have to do with hockey? It doesn’t, per se, but the film made me wonder about the conditions in which our hockey equipment is made and the environmental injustices that might be swept under the rug in the name of recreation and performance. We have a vested interest in this cause. As a business, we rely on freshwater to make our ice, on energy to fuel our operations and on healthy communities for our athletes, employees and fans to live, work and play. We have gotten very good at examining the environmental footprints that we make in our own backyard (e.g. driving to the rink, flying teams to games, and/or the garbage produced at games), because “being green” and “buying green” fit nicely in our capitalist logic. Having green options actually creates MORE waste because it means more products. Therefore, instead of asking consumers to change what we do, we are simply encouraged to change what we buy (e..g buy an electric car instead of using public transportation). Conversely, what we fail to calculate is how far our ecological footprints have travelled, or how many footprints came before it. As a result, this post is an investigative reflection on what it “costs” to score a goal, from the production of the equipment, to the cost to run the rinks, and the costs that the environment pays on our behalf. As we can see, the majority of products are made in China. Bauer Hockey is housed under the Performance Sports Group, which also includes Mission, and Easton, so I think my equipment list is probably pretty representative of most people’s gear. I will not focus on apparel issues here because we have more than enough literature on companies like Nike and Adidas. But if you want to re-visit an old post by Mark Norman on the politics of “Stanley Cup loser gear” it certainly fits well into this overall conversation, and is an added “cost” to consider. As the world governing body for the sporting goods industry, the WFSGI strives to promote fair and environmentally friendly working conditions. The WFSGI’s ideals are identical to those of sport. The organization campaigns for fairness, honesty, mutual understanding and high ethical standards in factories that produce sporting goods. The cooperation between FIFA and the WFSGI focuses on the fight against child labour and forced labour, as well as on improving working conditions and environmental protection. When FIFA issues seals of approval as part of the Quality Programme for Footballs, we cannot simply concentrate on the quality of the end product. We must also check the quality of the manufacturing process and ensure that people are treated properly. This doesn’t necessarily mean that FIFA does a good job of ensuring the type of “quality” that it promotes, but at least FIFA admits that labour conditions are an issue related to the consumption of its game, and fans and companies alike can try to hold FIFA accountable to its words. I’m pretty sure that if I asked Commissioner Bettman about the labour conditions associated with hockey producing factories in China he would be confused by the question. That’s a problem. If you are wondering why I am talking about soccer it’s because no one has looked at these types of issues in hockey; therefore, I am forced to “import” for the sake of analysis. In Lund-Thomsen, Nadvi, Chan, Khara and Xue’s (2012) article about labour conditions associated with the production of soccer balls in India, Pakistan, and China, they found that the median hourly wage for factory workers in China was 89 cents (USD). That is considerably higher than factory workers in Pakistan (38 cents) and India (24 cents); but, is still an exploitative wage considering we buy equipment for hundreds of dollars. The discrepancy in wages between countries is associated to the machine productivity that is available in China with the average workers stitching almost 40 soccer balls per day, whereas an Indian hand stitcher can only produce 4 soccer balls a day. Those in the Chinese factories also averaged 10 hour work days, 6 days a week. According to the study, the average Guangdong, China factory worker made $439 USD a month, compared to those who would stitch soccer balls at home and earn anywhere from $65-$92 a month. One positive takeaway from Lund-Thomsen et al’s article is that they barely observed child labour in the factories; however, in China there was anecdotal evidence that prison labour might be used in some cases. Additionally, migrant labourers in Guangdong were “generally denied the benefits of a family life throughout the year” (p.1233). Thus, we have to consider the exploitative labour costs, the occupational health costs such as deformed fingers from stitching, and also loss of family life as costs that are incurred for the recreation and leisure of distant consumers. If we turn our attention to the factories in Thailand, we must acknowledge the fact that much of their labour is produced by undocumented (female) migrants, such as the Burmese. Because they are undocumented, they are essentially a disposable workforce. From what I have read, daily wages for garment workers can range from $9-$28 USD in Thailand but as of 2013, the minimum wage for Thailand was set at $10 USD per day. Compared to the Cambodian and Burmese minimum wages, noted at $2.03 USD and 58 cents, respectively, we can see why many of them illegally make their way into Thailand to find a job. However, when they are undocumented, their employers are under no obligation to pay the minimum wage. Here we can use garment worker wages to give us an idea of what wages and conditions those making Bauer equipment might be under. But that’s just Asia, right? Those kinds of conditions don’t exist in North America, right? Wrong. Jump down the equipment list to Mexico. When the North American Free Trade Agreement was created in the 1990s the belief (or lies) was that conditions would improve for the maquiladora industry. Unfortunately, in a global economy, competition really means that your wages cannot increase; therefore, wages and conditions remain inhospitable, to say the least. “Mexico, with its lax pollution regulations and labor enforcement, would become a magnet for multinational corporations looking to cut costs, critics argued.” Anecdotally, some maquiladoras make approximately 5,200 pesos a month in the manufacturing sector (inclusive of cars, garments, electronics etc. ), which equates to about $400 USD per month. A monthly mortgage payment can run you 2,500 pesos, so that leaves you half of your monthly wage for food and other expenses. Not to mention the fact that Mexico is a civil disaster with the drug cartel violence these days. Consequently, when you read that my Warrior hockey stick was “Made in Mexico” you had better not be picturing the touristy, all-inclusive Mexico. You should be envisioning the Mexico that lies beyond the resort boundaries – the Mexico where tourists are told not to venture. I understand that some argue that factory work is “better than nothing” for many of these people, which is true to an extent. There is, however, no reason that the jobs created from our consumption habits should not pay others a living wage. For my purposes a living wage is considered a wage that enables people to have enough money left over to save for a rainy day, to cover medical/housing emergencies etc., to not have to choose which children they send to school, to make enough to feed their families and put a proper roof over their heads. Just because we can get away with paying these workers next to nothing for their labour does not mean that we should. I “can” slash the refs feet from under him/her during the opening face off but that doesn’t mean that I “should” do it. Right and wrong is, for the most part, pretty evident in our daily lives but we are so far removed from the production process of the things that we consume, right and wrong don’t even become daily considerations for most of us. Now let’s move on to the environmental impact of equipment production. Most pieces of protective gear use expanded polypropylene (EPP) foam. EPP is found in many different pieces of hockey equipment because it is an “impact absorbing foam” with “high strength properties” and “is resistant to water, chemicals, and most oils.” This, apparently, is an environmentally-friendly foam that is easily recycled and is 100% non-toxic. That is good news. Still, the production of EPP has a carbon footprint. I wasn’t able to find any numbers about that footprint but JSP, the manufacturer of ARPRO (the trademarked name of EPP) claims that it has achieved “a 23% reduction in CO2 emission, water use and waste.” It seems that the production of EPP/ARPRO uses a lot of water since JSP was able to save “almost 9,000,000 litres” of it since starting its MINUS40% sustainability initiative. That’s a lot of water to save, and it only leaves me wondering how much they continue to require. Hockey sticks are, for most people, the piece of equipment that sees the most turnover. According to Total Hockey, 3.2 million composite sticks are sold each year and, evidently, there is no good use for recycled carbon fibre at this point. I have read elsewhere that carbon fibre is downcycled more than it is recycled, which means that because it loses some of its original strength properties upon “recycling,” it gets moved down the chain of carbon fibre uses: airplanes – cars – sporting equipment – consumer electronics. 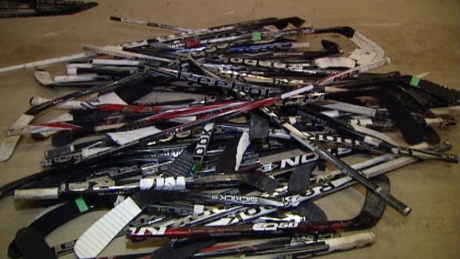 In 2012, Total Hockey started the HockeyGreen initiative asking people to bring in their old and broken composite sticks for a $10 credit towards a new stick. The hope is that with a single collection of used composite sticks researchers can find a new use for them. Hopefully this day comes sooner than later, but, here again, our consumption of sticks is not brought into question. Nor do we question the need for new models to come out every year from every manufacturer. Planned obsolescence will always be environmentally unsustainable. If you want to read more about the environmental problems posed by carbon fibre, check out this article from Bike Radar about how un-green the carbon fibre bike is. Beyond this, I’m not entirely sure what is involved in making the carbon fibre itself but considering how synthetic the material is, my guess is that it creates a significant ecological footprint. I am randomly going to add plastic bags into the discussion. We all know how harmful they are to the environment, which is why most houses now have equal amounts of re-usable and plastic bags. When I worked at Sportchek the amount of plastic bags that we would throw away after unboxing all of the equipment was tremendous. It wasn’t something that I thought about at the time but every pair of shin pads comes in its own plastic bag, every pair of gloves gets its own bag, sticks are bundled into plastic bags, and hockey bags come in plastic bags. The staffers diligently remove all of these bags so that the products are ready to be tried on and touched. This is one more step in the process where the consumer is shielded from the “true costs” of their equipment. Now, the rink. As of 2020, the US Environmental Protection Agency will no longer allow hydrocholoroflurocarbons (HCFC) to be used as a refrigerant in ice making. It is currently being phased out because it depletes the ozone layer, is linked to skin cancer, and contributes to greenhouse gases. A Natural Resources of Canada research study found that 62% of the rinks in Quebec use HCFC as a refrigerant, and 30% use ammonia, which is a natural substance but is also toxic when inhaled and corrosive to the touch. Do you or any of your teammates tend to cough whenever they enter the rink? It might be from the ammonia in the ice, or from the ice resurfacers (colloquially known as Zambonis) when they emit nitrous oxide (can be an eye, throat and nose irritant), carbon monoxide, and hydrocarbons. If your rink uses an older Zamboni this may considerably affect the air quality in the rink. 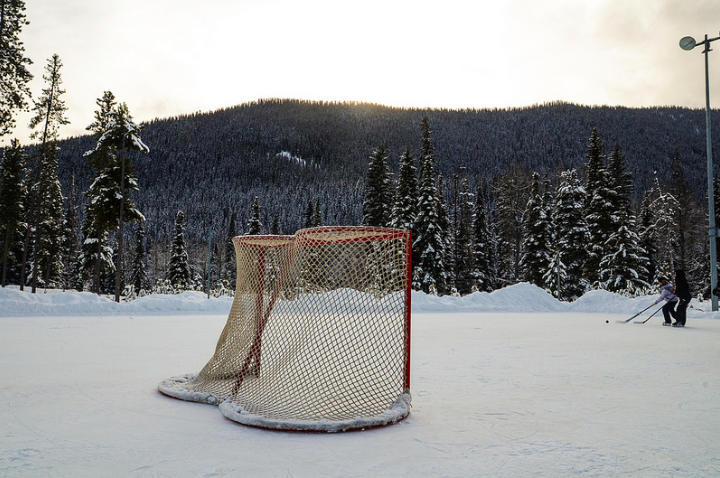 So while outdoor hockey has been referred to by David Suzuki as an endangered sport, the health and climate implications of indoor rinks should also be considered in the “true cost” of the sport. I think a fitting way to end this article is to look at the hockey puck. Pucks are only made in four countries around the world: Canada, Russia, China, and the Czech Republic. Rubber is combined with sulphur, coal dust (carbon black), two types of oil, and calcium carbonate. Over 40 million pucks are sold each year. If you haven’t already figured it out, hockey pucks are not cool for the environment. They are non-biodegradable and hard to recycle. The production process uses non-renewable resources and the extraction of these resources are environmentally harmful. Since they are only transported from four countries, what is the environmental cost of shipping pucks to hockey playing nations? Additionally, many pucks are made with synthetic rubber which is petroleum based. 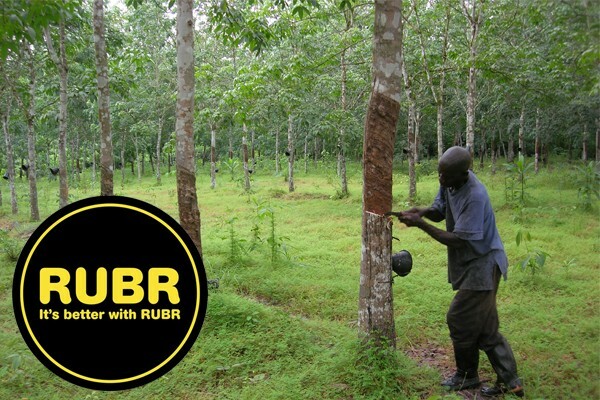 The Canadian company RUBR is trying to make more “sustainable” and ethical pucks by importing rubber trees from Liberia. While it may be socially beneficial (although I might argue that setting up a factory in Liberia might be more beneficial for all involved), is this approach environmentally sustainable? I don’t think any hockey player has ever thrown out a puck but clearly these millions of pucks are going to catch up with us at some point because there are few re-use options for them. Photo from Engineers Without Borders. This argument is made as if we in the West are mere spectators to this reckless and dirty model of economic growth. As if it was not our governments and our multinationals that pushed a model of export-led development that made all of this possible. It is said as if it were not our own corporations who, with single-minded determination (and with full participation from China’s autocratic rules), turned the Pearl River Delta into their carbon spewing economic zone, with the goods going straight onto container ships headed to our superstores. In other words, OF COURSE China, India, and Brazil pollute more than the rest of us – they are making all of the things that we consume. When we outsource our manufacturing, we also outsource our emissions and environmental impact. These facts are lost when we calculate how “green” something is. It’s like blaming the goalie for every goal scored against him/her. It doesn’t make sense when it’s a team sport and every goal can be attributed to multiple defensive failures. Likewise, we live in a globalized/connected world, to our benefit, but any time something bad happens we point the finger across the pond. Blaming the goalie is a terrible way of fostering team morale, just like blaming distant workers for climate degradation does little to address the situation we have all created. If the NHL really wants to be “green” then (1) it had better re-evaluate how it measures its ecological footprint, and (2) make strides towards replacing the values of performance and profit with the value of sustainability. Because as long as performance and profit are the main factors, the pros will go through composite sticks like toilet paper, sock tape will continue to sit in our landfills, and polyester third jerseys will be made by exploited workers of colour. Klein argues that “we need to be very clear: because of our decades of collective denial, no gradual incremental options are now available to us”; therefore, job one, is to consume less – starting today. We don’t need new innovations of gear every few months. Sorry Bauer, but that’s the truth. At the very least, I am suggesting that our fun and profits cannot continue to be at the expense of people that we will never meet, simply because we will never meet them. When you realize how many people you figuratively carry on your body in a hockey game, two assists for that goal doesn’t seem like nearly enough, does it? This reflection is far from a comprehensive look at the social and environmental implications of us playing hockey, so if you have other questions or knowledge about part of the supply/production chain please comment below. While writing this post, I enquired with a local sports exchange/consignment store to find out what happens with consigned equipment that cannot be sold. I wasn’t sure if/when anyone would get back to me, but I was able to chat with a representative on the phone today. Fortunately, it seems that consigned second-hand sports equipment moves quite well, but this is dependent on what the store predicts will re-sell. Therefore, it’s the stuff that is still in good working order and doesn’t look like it barely survived WWII. However, for the small percentage of gear that they cannot re-sell, it ends up in the landfill because there are no viable recycling options for our sporting equipment, especially pieces that are made from multiple materials (e.g. skates, bicycles, skis etc.). Therefore, just because your old equipment is out of your house doesn’t mean that it is no longer a problem. As the representative I spoke to stated, this should be a big ask from consumers to demand equipment from the manufacturers that can be recycled. What do you want me to do with your gear once it has out lived its use or YOU have made it obsolete? When can we expect a fully recyclable skate/stick/shin pad etc. from your company? Lund-Thomsen, P., Nadvi, K., Chan, A., Khara, N. & Xue, H. (2012). 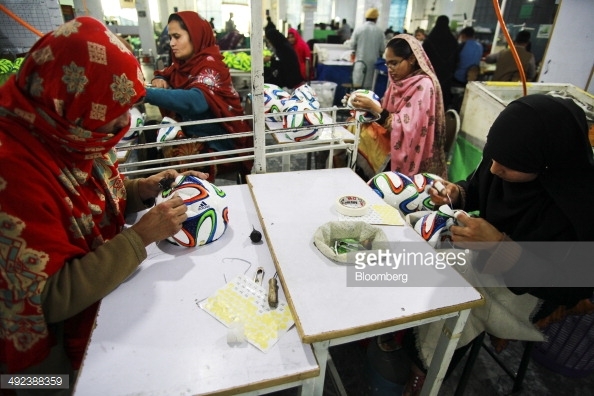 Labour in global value chains: Work conditions in football manufacturing in China, India and Pakistan. Development and Change, 43(6), 1211-1237.